There once was a girl, who had a little curl right in the middle of her forehead. And when she was bad — she was horrid. Imagine that rhyme read by a child in a creepy sing-song whisper. Gives me chills as an adult. But at five I found that word — Horrid — fascinating for some reason. I think in part because I was unsure how it should rhyme with “forehead” in the rhyme. But also because it had a delicious mouthfeel, a sort of woody British caramel of a word. Horrid. Horrid. Oh, that’s simply horrid. Horrid. Here’s where my actions become less clear to me. 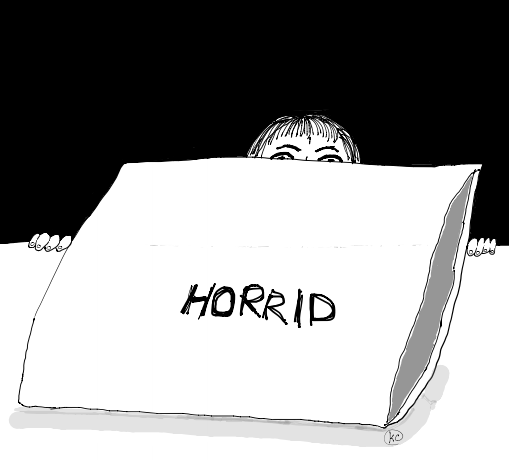 I made the decision to pick up a black ball-point pen and write the word “Horrid” on my pillow. This was a one-time event. The only thing I have ever written on a pillow was the word horrid. Maybe I wanted to look at the word each day when I went to bed? I don’t know. All I know is that when you scrawl a word on a pillow with a ball-point pen in a child’s handwriting, the result is terrifying, especially if the word is Horrid. My parents must have been secretly petrified of me. This entry was posted in Depression, Random thoughts and tagged creepy, funny, horrid, humor, kid, pillow, weird on November 21, 2014 by notesfromthebathroomfloor. 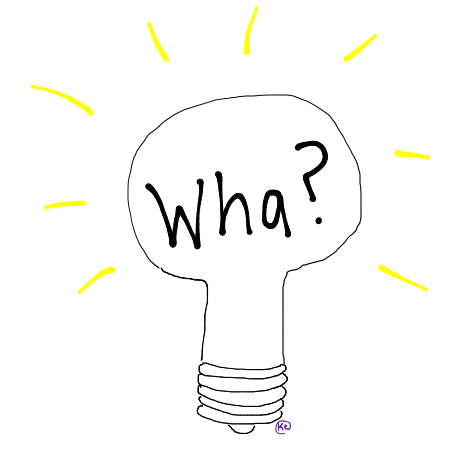 Sometimes I sit and brainstorm lists of ideas for subjects to write about, either for this blog or for a sketch-writing class that I’m taking. Here’s a list I put together one night last week, just before falling asleep. I honestly don’t know what many of them mean. I feel like I found someone else’s diary entry, and I’m frankly concerned for the mental health of the writer. This entry was posted in Random thoughts and tagged funny, ideas, weird, writing on November 2, 2014 by notesfromthebathroomfloor. 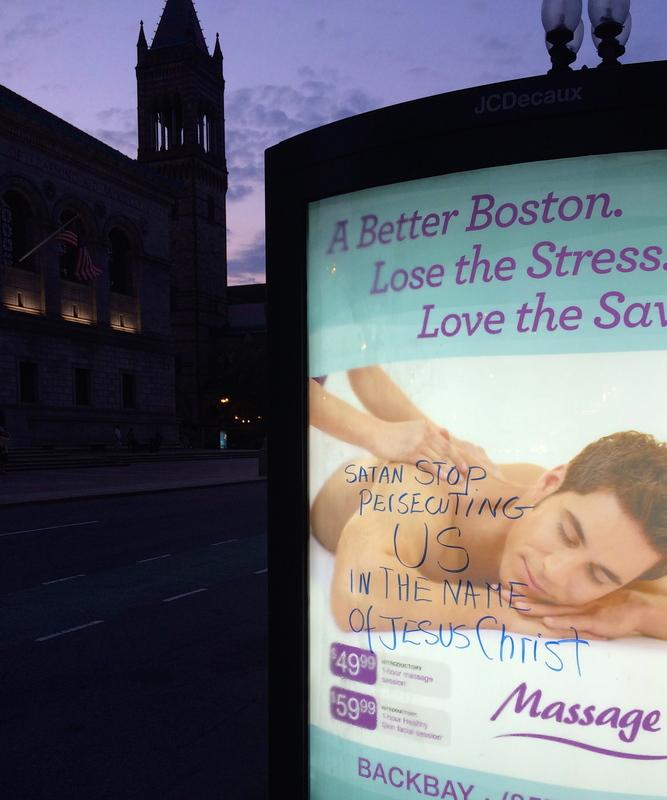 I came upon this sign in Copley Square a couple of weeks ago. You know, I visited a Massage Envy many years ago and had a massage that was not to be envied. This entry was posted in happiness, Random thoughts and tagged boston, funny, graffiti, humor, massage, massage envy, satan, weird on September 4, 2014 by notesfromthebathroomfloor.